With over 100 seasonal displays, visiting Krodel Park’s Christmas Fantasy Light Show is one way to have a festive night out during the holiday season. POINT PLEASANT — One of the city’s biggest holiday attractions will be opening for the season this evening (Wednesday). Having over 100 seasonal displays, Krodel Park’s Christmas Fantasy Light Show will be running from now until Monday, Dec. 31. Each night the show will run from 5:30-9 p.m., admission is free though donations are appreciated to fund next year’s show. Guests are welcome to drive through the displays or park their cars and take a stroll through the park taking in the views of the light show. Visitors from all around the area, not just in Mason County, come out to experience this yearly festive event, which has now been running for 18 years. This event is under the direction of Main Street Point Pleasant which funds the event and organizes the volunteers. Workers with the City of Point Pleasant assemble the displays at the park and the city pays for the electricity. The city begins their work several weeks prior to the opening date as workers have to first replace any faulty bulbs before building the displays. When Charles Humphreys, director of Main Street Point Pleasant, began working in the city in 2001 he felt the town needed to have added flare, so he started the light show to run through the holiday season. Since then, it has grown to include corporate sponsors and has become one of the biggest holiday attractions for the City of Point Pleasant. This annual event gets an early start to the holiday season by lighting up around Thanksgiving, so those visiting this week, but not at Christmas, have an opportunity to see it and make plans to return next year. Visiting the show has become a yearly tradition for generations of families. Each year, the visitors always experience an added feature to the show to keep each year’s visit fresh. Volunteers help work the gate each year to collect donations. Volunteers for this event are always welcome and appreciated. 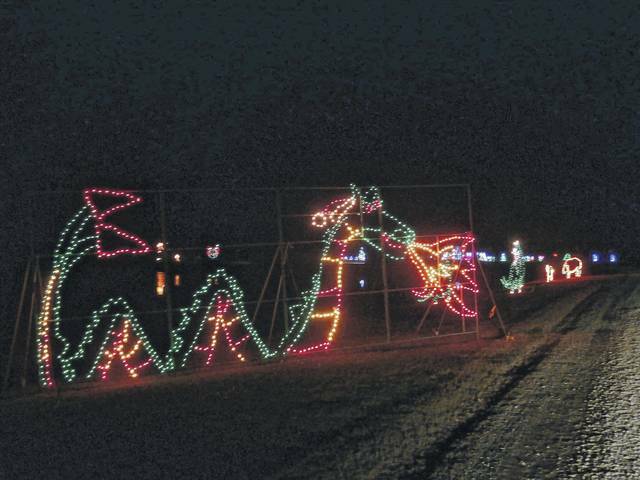 https://www.mydailytribune.com/wp-content/uploads/sites/42/2018/11/web1_11.22-PPR-Lights-1.jpgWith over 100 seasonal displays, visiting Krodel Park’s Christmas Fantasy Light Show is one way to have a festive night out during the holiday season.